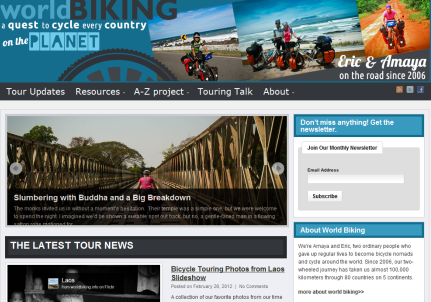 Bicycle Touring Resources from Ride Earth – Go Bicycle Touring! 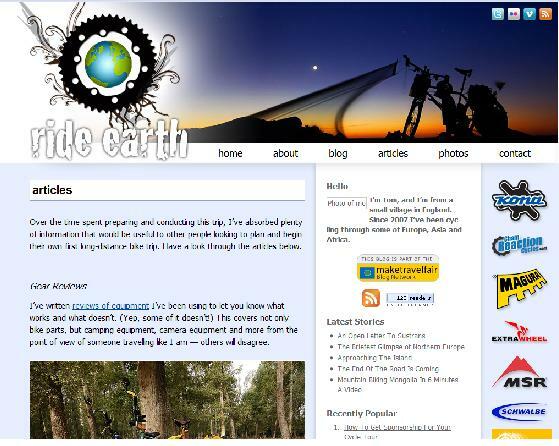 If you’re in search of detailed how-to articles on bicycle touring, Ride Earth is a good place to start. Tom, the blog’s co-author, has put together a wealth of resources based on knowledge gathered during his multi-year tour through Africa, Asia, the Middle East and Europe. One of the most popular resources on Ride Earth is the four-part series How to Build the Perfect Expedition Bike. Tom deals with everything from brakes and bottom bracket to spokes and suspension. The information is technical, but written in a way that allows even novices to get a handle on the situation. If you’re dreaming of a long-distance tour, but cash is an issue, you’ll want to check out How to get Sponsorship for your Cycle Tour. This is the most detailed article I’ve read on the subject. Another helpful post is How to Film Your Solo Expedition. Here you’ll learn not just camera techniques, but also how to tell the story of a bicycle touring adventure. Tom is a man of many talents, one of which is photography. My jaw actually dropped when I took a look at his Top Ten Most Interesting Bicycle Touring Photos. 1,222 days after riding away from his front door on a bicycle, Tom cycled home on 27 October, 2010. For the time being, we’ll have to be content with browsing the archives for travel tales. But I’ve got an inkling he’ll be back on the road soon. Check out Ride Earth.